So, yeah, what she said. 🙂 Laura is simply awesome. Go ahead and be sure to read the article and come back. I’ll be right here. It is baffling, and I do feel for people. How come they can read all the right books, go to the right classes, follow the proper recipe, and still end up with a freaked out adolescent? Well, if I could boil the most challenging behavior issues down to a single root cause, I have to say it wouldn’t be lack of socialization that’s the problem, it would be this: not preparing either yourself or your dog for the challenges of socialization in the first place. I think in our haste to get puppies out there to see the world, it really is usually sink or swim for them and for us. If the puppy has a super stable temperament, you might get away with it, but what most often happens is either puppies are overwhelmed and end up hyper-sensitized to the things you are hoping they’ll learn to like, or they get ample opportunities to practice all sorts of wild and woolly behaviors that are just not good for them in the long run, behaviors like lunging and pulling towards every dog they see, jumping on people, barking at motorcycles, going crazy when the leash gets put on…just basically equating the outside world with loosing their little puppy minds. As I mentioned before, puppies are learning machines. Repeat pattern of get-leash-put-on—-> WHOO HOO!!! We are off to Disneyland!… Or, see a group of children approaching, or a dog coming directly down the sidewalk at you, feeling nervous, and not being able to escape because the leash is too tight enough times, and, if the puppy is of a certain sensitive temperament, that’s it. It is really really hard to undo those first impressions once they occur. So, what do I mean by preparing the puppy for “safe” socialization? FOUNDATION SKILLS. FOUNDATION SKILLS. FOUNDATION SKILLS. Take a little assessment. Can your puppy do the following things? (If not, don’t even bother heading out the door). Leash and harness on and off with no fuss, no leash biting, no nipping hands, just quiet, calm sitting and a happy look because leash means training time, relax time, and treats. Relax on a mat. Does puppy know how to anchor to a safe spot and can remain there happily for up to ten minutes at a time with mild to moderate distractions in several rooms of the house and in the yard? (Want to learn how? Buy this great book, Chill Out Fido by Nan Arthur). Name response and eye contact. Does the puppy have a solid reinforcement history (a minimum of 1,000 treats for looking at you, responding to his name, coming when called)? Basic leash walking. (Does not have to be perfect heeling!) Puppy can follow you happily on a loose leash when you change direction, and is non-fussy when you ask him to move in a different direction sometimes than he wants to go. A pre-trained Let’s Go! U-turn Cue (particularly important for excitable or reactive puppies). This is how you get them away from startling or arousing things without struggle. Focus. Can puppy stay focused, and respond to his name and Let’s go! all around your front yard or driveway? Is puppy relaxed and calm in the house majority of the time? (Other than regular puppy goofies)? Eating well? Sleeping soundly? Playful? (Human skill) A good understanding on your part of puppy’s all time highest value food and toy rewards. You’ll need to take these out with you everywhere you go for the next six months at least. (Human skill) A healthy respect for your puppy’s ability to handle proximity to people or other dogs. At what distance can he or she be around new people or other dogs and still remain responsive to you? If you answer yes to these things, then great! You are ready to head out for short outings to mellow places to meet friendly people, or just watch them at a distance. Here is a nice example of what that can look like when you’ve done your homework. This is a client’s dog, Ghilly, practicing Relax on a Mat on a busy street. Note: it took six weeks of foundation work to teach her how to do this. 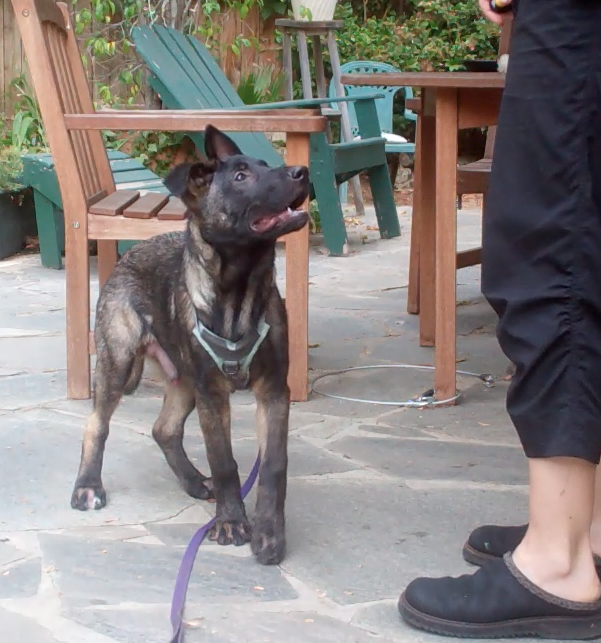 In puppy class she lunged non-stop and screamed like a banshee, so we nixed that idea early. If you answered no. My advise is, put socialization on a back burner. Go back to your kitchen. Get a nice, big baggie of really good treats and get to work. (Don’t have a clicker trainer near you to learn from? Check out Cyber Dog Online!) The clock is ticking, but if you want a puppy that can not only be polite in public, but actually feel SAFE with you in public, these foundation skills are the cornerstones you need. 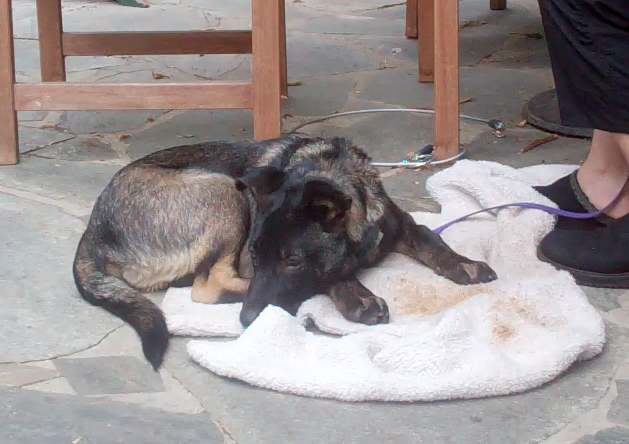 Our little Zydeco is an especially reactive puppy, and his life has been a bit tumultuous to say the least. He currently gets so aroused outside of the house he attacks the leash, and tends to bark explosively at all people. Although he is just hitting four months old, and there is some urgency to get him some exposure to new things fairly quickly, I’ve opted to err on the side of caution and wait. He’s been with us for only a week. He trusts me now, and seems to understand that I am the source of pretty awesome stuff like canned cat food, deli meats, and great fuzzy toys. He has successfully met several new people here too, as well as two new dogs. He is very brave, and constantly exploring and learning. He’s had a ton of new experiences in the last week actually–but none of them outside the house. Best of all, he’s been relaxed and successful through just about all of it…and that is the point of it all anyway. Now that he and I seem to be grooving on each other, and there is some trust there, his training has begun in earnest. My goal is to take him on a short outing next Saturday to a very quiet park, maybe early in the morning. He is a sharp cookie. His foundation skills already coming along nicely. My hope is that during our adventure he can relax, stay focused, eat lots of yummies, play, and have as much goofy fun there as he does here. I will keep ya posted! Hi Sharon, thanks for the kind words. Go to mat when the door opens is a fantastic behavior! My dogs go to crates or go to the kitchen where there is a gate when the doorbell rings. Works great–and keeps any reactivity to a minimum. 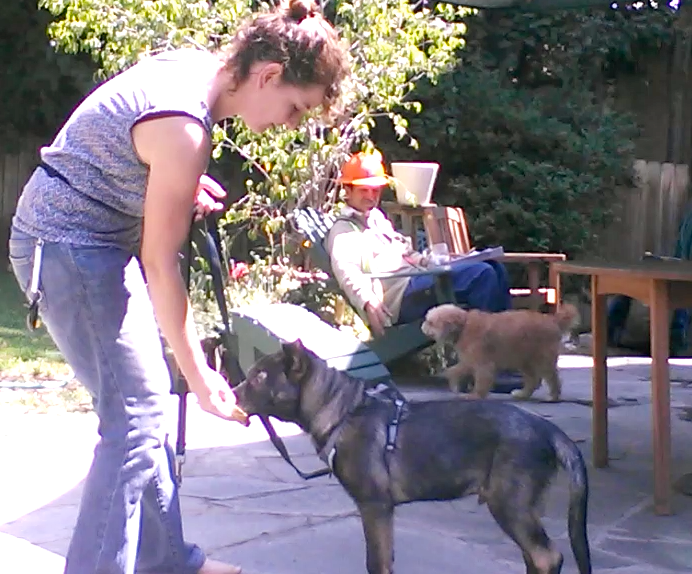 I also really like teaching dogs to step into their own harnesses. So, good for you there too! Keep having fun! September 11, 2013 - 10:57 pm The Everyday Dog Positive Training of the South Shore and Plymouth County, Ma.